Benjamin Henry Latrobe was born in England in 1764. The son of a Moravian clergyman, Latrobe traveled to Germany for a broad education in the liberal arts and sciences. After his return to England, he held several minor government posts and worked as an engineer and surveyor, and later he turned to architecture. Latrobe began his architectural career in the office of Samuel Pepys Cockerell, a leading neoclassical architect, before receiving several domestic commissions as an independent architect. In 1796 Latrobe immigrated to Virginia, where he quickly secured architectural commissions for both residences and public buildings, including the Virginia State Penitentiary (1797-1806). From 1798 until 1807 Latrobe was based in Philadelphia. His Philadelphia commission for the Bank of Pennsylvania (1798-1801), was the first major example of the Greek revival style in America. During this period Latrobe’s designs included the Philadelphia Waterworks (1799), a canal linking the Chesapeake and Delaware bay (1801-1802), and Princeton’s Nassau Hall (1802). Latrobe also introduced the use of Gothic Revival for domestic architecture to America with his design of “Sedgeley” (c. 1799-1802), the house of William Cramond on the banks of the Schulykill River. But soon Latrobe became more than a Philadelphia architect. In 1803, President Thomas Jefferson appointed Latrobe as surveyor of public buildings. His main charge was to oversee the construction of the United States Capitol. In 1807, Latrobe left Philadelphia to live in Washington and later in Baltimore. He became the young nation’s preeminent architect, designing many important public buildings and public works as well as residences and churches throughout the emerging nation. Latrobe also educated America’s next generation of architects, engineers and craftsmen, including Robert Mills and William Strickland. Latrobe contributed to the second campus of the University of Pennsylvania. 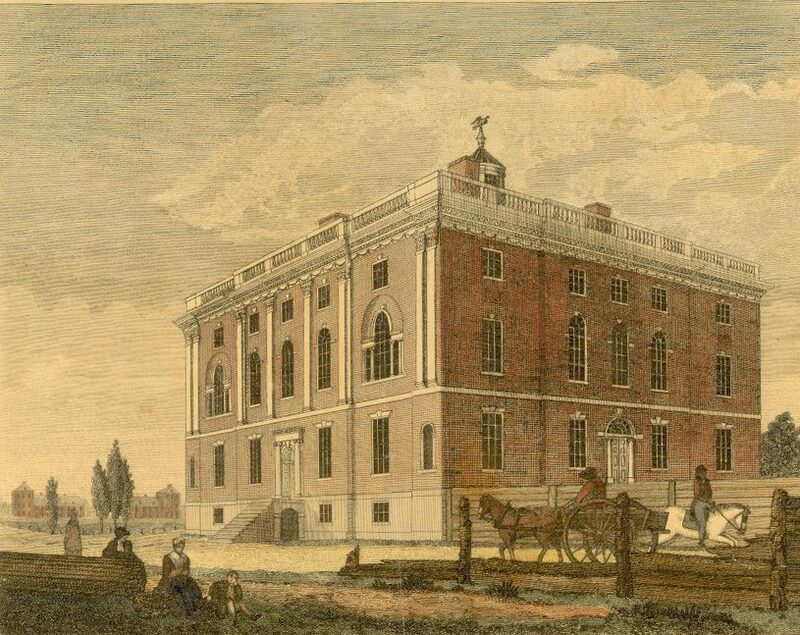 In 1792 William Williams was commissioned as architect for a house at Ninth and Market Streets in Philadelphia, intended as the residence for the President of the United States. When Washington, D.C., was created as the national capital before the Philadelphia President’s House was completed in 1797, the University of Pennsylvania bought the property for use as its second campus. In 1800 Benjamin Latrobe was hired as the architect of the additions and renovations (including the removal of the central stair) to prepare the building for use by the University to house both the College and the Medical School. By 1829 the “President’s House” had become inadequate for these purposes and was demolished for the construction of two separate buildings designed by William Strickland, one for the College and the other for the Medical School.